Supportive family environments that provide acceptance, guidance, nurturance, and cognitive stimulation promote children’s socio-emotional and language development. Although economically disadvantaged families are faced with multiple challenges, including joblessness, relational and residential instability, and neighborhood disadvantage/crime, positive parenting strategies and couple relationship functioning can attenuate the strength of the detrimental effect of risk factors on children’s wellbeing. Further, family-focused intervention programs have positive effects on parental mental health, parent-child relationships, co-parenting, and couple relationship functioning. In the first part of my talk, I will present my research focusing on maternal and paternal parenting strategies and children’s socio-emotional and language development across racial/ethnic groups in the United States, as well as Caribbean and African countries. Next, I will discuss the role of families’ insufficient economic resources and paternal mental health on young children’s socio-emotional development via paternal engagement in children’s lives and couple’s conflict management strategies. 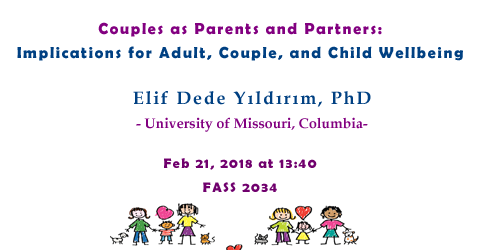 In the last part, I will present my work assessing the effect of family-focused intervention programs on parenting, co-parenting, couple relationship functioning, and children’s wellbeing, considering program dosage and attendance.